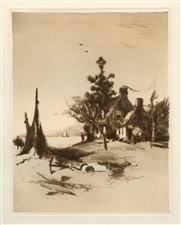 Charles Vanderhoof original etching "The Fisherman's Home"
Medium: original etching and drypoint. This rich, dark impression on heavy cream wove paper is from the Sylvester R. Koehler portfolio of etchings, published in 1885 by Cassell & Company. Plate size: 7 1/2 x 6 inches. Not signed.